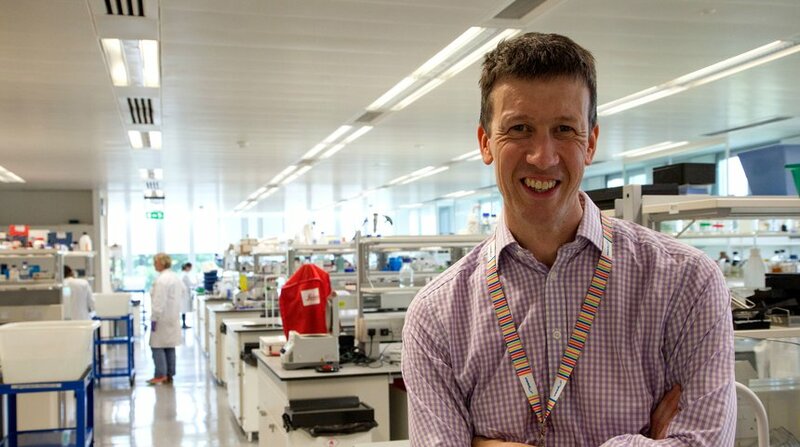 Professor Iain McNeish is the Director of the Ovarian Cancer Action Research Centre. He is also working on the British Translational Research Ovarian Cancer Collaborative (BriTROC) project, a pioneering study into why ovarian cancer keeps coming back. He was previously the professor of gynaecological oncology at the Institute of Cancer Sciences at the University of Glasgow. What is your role at the Ovarian Cancer Action Research Centre? As the Director of the Research Centre, my aim is to build upon the success of the past decade and to explore new areas of research. For example, my lab has been investigating the interaction between ovarian cancer and the immune system and I hope to continue that work here. Why is ovarian cancer research so important? It's only through research that we will improve the diagnosis and treatment of ovarian cancer in women in the UK and throughout the world. There is so much we need to learn but I'm inspired to keep trying because I'm fascinated by this disease and determined to do my part if we are to cure more women. I certainly always wanted to be a doctor – apparently I announced this to anyone who would listen when I was about three years old. My interest in science and research was kindled at medical school. I had a brief wobble when I thought about becoming a conductor, (orchestra rather than bus), but reality and common sense prevailed. I embarked on a PhD soon after qualifying in medicine, which is when I became interested in ovarian cancer. I've had the privilege (and challenge) of being able to combine laboratory research in ovarian cancer and clinical work as a medical oncologist since the end of my PhD in 1998. I have hugely enjoyed my career and feel there are still many exciting things to come! One of my highlights has been co-leading the 'BriTROC' project, which brought 15 UK ovarian cancer centres together to collect tumour samples and address important issues, such as the intriguing question of how ovarian cancer changes and evolves as it relapses and becomes resistant to chemotherapy. What keeps you motivated on a hard day? In clinic, telling a woman that her cancer has come back is one of the most difficult things ever, for all the reasons that you can imagine. What keeps me going is knowing that there are still lots of things we can do to help women with ovarian cancer that comes back and that we are working really hard to develop better treatments. A bad day in the lab is one where a grant gets rejected or an experiment doesn’t work, again. At that point, you just grit your teeth and keep trying. Knowing that our research will help women is always a very powerful motivator. What are your hopes for the future of the Ovarian Cancer Research Centre? Quite simply, I wish the Research Centre to be at the forefront of international research efforts in ovarian cancer. I want it to be driving the research agenda; to be addressing critical questions; to be collaborating with others worldwide; and to be a beacon in international efforts to cure ovarian cancer. Donate £5 today to Professor Iain McNeish's ovarian cancer research to prevent ovarian cancer coming back.